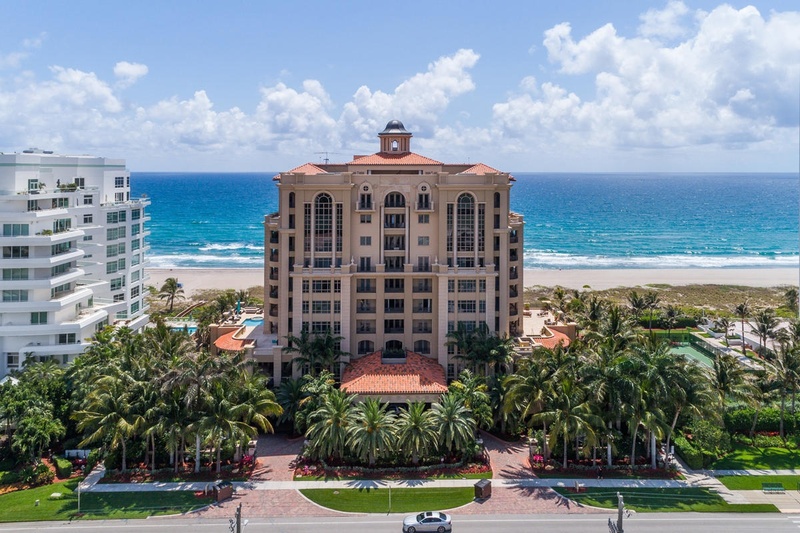 Luxuria is an exclusive oceanfront enclave of just 26 ultra-luxurious estate residences in a 10-story tower situated on the prestigious South Ocean Boulevard (A1A) in Boca Raton, Florida. The residences of Luxuria feel like single family houses on the beach, with the luxury and convenience of a condominium; someone else will take care of them. Offering enormous square footage, private deep terraces that provide a "backyard" overlooking a picturesque backdrop, Luxuria is suitable for both relaxation and entertaining. Completed in 2008, Luxuria was designed to be the most luxurious condominium residence in the world, influenced by Italian and Mediterranean architecture to accomplish a blend of Old World elegance and modern innovation. Luxuria greets you with an opulent porte-cochere entry as the valet parks your vehicle and you enter into a two-story grand lobby. The lobby features wood-paneled walls lined with impressive European art collections, cascading waterfalls, and gold and onyx highlights throughout. Residences of Luxuria are one of a kind, offering estate residence "condominiums," two 2-story penthouses, and even a single family custom estate home. The residences feature restricted-access elevators which use fingerprint technology, leading to your front door which offers the same keyless entry system. Interior features include floor-to-ceiling walls of glass, designer-ready gas fireplaces, spa bathrooms with marble floors, onyx countertops, Jacuzzi tubs, and 17" Flat Screen TV's behind the vanity mirrors. Gourmet kitchens in Luxuria offer the finest appliances, cabinetry and finishes - Sub Zero, Miele, Franke, and Thermador. The outdoor spas, cabana bathrooms, and summer kitchens enable residents to barbeque. Two of the homes feature 2-stories with over 20-foot ceilings. Four of the estate residences have private swimming pools and all of the penthouses and single-family homes include a midnight kitchen. Luxuria's homes range in size from 4,500 square feet to more than 12,000 square feet of air conditioned space; the terraces range in size from 755 square feet to just under 7,000 square feet! Luxuria is situated on approximately 2.5 acres with 265 feet of prime beachfront, directly bordering the ocean in Boca Raton, just north of Camino Real. A short drive to the vibrant daytime activities and nightlife of Boca Raton's downtown, which includes Mizner Park's chic restaurants and shoppes, Royal Palm Plaza, and just minutes from Town Center of Boca Raton mall anchored by Saks Fifth Avenue, Neiman Marcus, and Nordstrom.